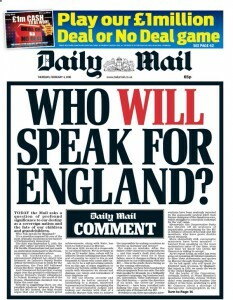 The headline “Who will speak for England?” echoes a challenge from just before the declaration of war. Germany had just invaded Poland and Chamberlain as Prime Minister had explained to the Commons why he had not already declared war. Tory MP Leo Amery, an opponent of appeasement, was angered. As Arthur Greenwood rose to reply for Labour, Amery shouted across the chamber “Speak for England” — with the implication that the Prime Minister was out of touch. It’s a good story, but what has it to do with the EU? The implication that we are now in a re-run of 1939 is spectacularly wrong. In 1939, Europe was spiralling into war. The EU was born out of a desire to stop this ever happening again. The jury is out on Chamberlain’s actions. At the time, his detractors accused thought he was being weak. A fairer assessment is that he was trying to spare Europe the horrors of another war. At the very least, his “appeasement” bought time for British military resources to prepare for war if that became unavoidable. In 2016 war is not on the cards. Britain’s interests lie in close cooperation with our European neighbours. From the beginning, the European project has been evolving. The process of reform has never stopped. Yes, there is more to change, but the way to do that is by working with others in the interest of all the peoples of Europe. In trying to whip up opinion against Cameron’s proposals and staying in the EU, the Daily Mail is attacking the process set up to stop any more wars in Europe. It’s hard not to read that as trying to turn the clock back to a bygone age — which included wars in Europe. And in the middle of all of this “Who speaks for England?” overlooks the rest of the UK. Perhaps that is a slip — a forgetting of the rest of the UK — but it is far from clear that Brexit wouldn’t also lead to the breakup of the UK, and an England in less-than-splended isolation. The bigger picture is that something truly evil was abreast in the rise of facism — whether that was Hitler in Germany, Franco in Spain, Mussolini in Italy, or Oswald Mosley in the UK. It’s too easy to blame Germany and overlook the possibility of the UK heading in that direction. The Nazi idea of concentration camps was something we British had pioneered in the Boer War, and anti-semitism was alive and kicking here as well. Part of the European vision is to give us collectively a way to entrench the values of human decency which we aspire to and protect us from such pulls in the future. In the last few months, the EU has been acting to counter things undermining freedom from the “Law and Justice” party in Poland and Viktor Orban’s government in Hungary. The EU’s ways of approaching this are complex — so that they don’t stop the expression of genuine political difference and do encourage freedom and diversity. The lesson of the EU is that there are alternatives to war. “Who speaks for England?” might have made sense on the brink of war. The question for now is “Who keeps us from getting near the brink of war?”. The answer to that question is the politicians and civil servants who have been working hard to find a solution since the renegotiation was first mooted.